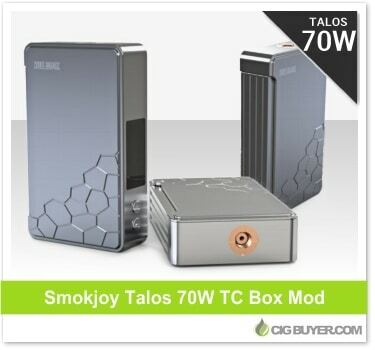 Although we’re not too familiar with Smokjoy, the Smokjoy Talos Box Mod recently caught our attention because of it’s unique and stylish look. It offers up to 70W of output power with temperature control and various built-in safety features. It’s run by a single 18650 battery, includes a magnetic battery cover and spring-loaded 510 connection; but what really sets it apart is the cool honeycomb body engraving and the large, full-length firing button along the side (similar to the Smok XCube 2).